Where will the photographs be taken? How long will it take to receive my images? Can facial blemishes be removed? Do you offer any kind of payment plans? What happens if there is bad weather on the day of my shoot? No, Petruzzo Photography does not maintain a studio, which makes coordinating staff pictures much simpler. We serve our corporate and commercial clients directly in their homes and offices and we are able to create headshots in most environments. Can I change outfits during the shoot? Yes. However, it should be noted that depending where your session takes place, there may not be any officially sanctioned location to change clothes. Yes! If you would like to purchase headshots for your whole team, discounted group rates are available! Or, if you would like to offer conference attendees or clients headshots, talk to use about arranging a custom headshot day. We’ll be happy to help! Where will the photos be taken? The images will be captured in your home, office or outdoors in any stylistically relevant location. We are happy to provide recommendations. For most professionals, we recommend dressing like you would for a meeting with a client, or the way you would for a meeting with your boss. If possible, avoid jet black and pure white, but not if that means you don’t look like yourself. Definitely accessorize–watches, necklaces, decorative scarves, all add personality and dimension to your portrait. How long does it take to see the images? Standard turn around time is 10 days or less. Where there are deadline constraints, we make every effort to return those images quickly. Guaranteed rush delivery is also available for additional cost. How many images will I have to choose from? For individual sessions, you can expect to have around 10-15 images to choose from. For group sessions, it’s typical to have 3-6 different images to choose from. How can I use the images you create? Your license will allow for unlimited royalty free use of the images. Unless you’ve made special arrangements, the only limitation is against reselling or sub licensing the images. Will you photoshop my images? We will remove non-permanent blemishes during processing, and may slightly soften skin where it appears unrealistically rough. We are able to conduct more in depth adjustments as well for additional cost. I have a specific concept in mind, can you help? Definitely! We try to deliver a uniqueness to each of our clients and love the opportunity to help fill in your vision! Are there any other fees I should expect? There are no hidden fees on our listed services, however we do not include tax. Additionally, If you wish to schedule a session outside of our normal service area you will be required to pay for travel. You may also be required to pay for prints, advanced retouching, parking and event or location admissions costs incurred during the session. We accept all major credit cards, with a 2.9% credit card processing charge. You are also welcome to pay with a check to avoid any additional charges. We create a blend of photojournalism, lifestyle and traditional portraiture over a foundation of sentimentalism, expression and personality. Will you photoshop the images? Depending on the context of the image, we will remove some non-permanent blemishes and may slightly soften skin where it looks unnaturally rough. On portraits, we generally do not perform major cosmetic adjustments. Who will my photographer be? We have five regular members, and you will be invited to choose who best fits your style and personality. Do packages come with an album? Some of our packages do include beautiful heirloom wedding albums. Albums are also available a la carte starting at $299. How long before the images are finished? We do not guarantee a specific timeframe for delivery of your images because the quality of the images is our top priority. If the images need more time to look their best, we will delay delivery. However, the average turn around time for Classic Wedding Coverage is between 4 and 6 weeks. Will the images be edited? Absolutely. Every image we deliver will be processed to look it’s best. This typically means adjustments to color and tone, and in some cases light retouching. How many images are included? Unfortunately, this is an impossible question to answer, since every wedding is different. In general, however, in general a team of two photographers will create around 100 images per hour. Yes! Credit card payments are welcome, but do include a 2.5% credit card processing fee. You can avoid the processing fee by paying with a check. How far in advance should we book? 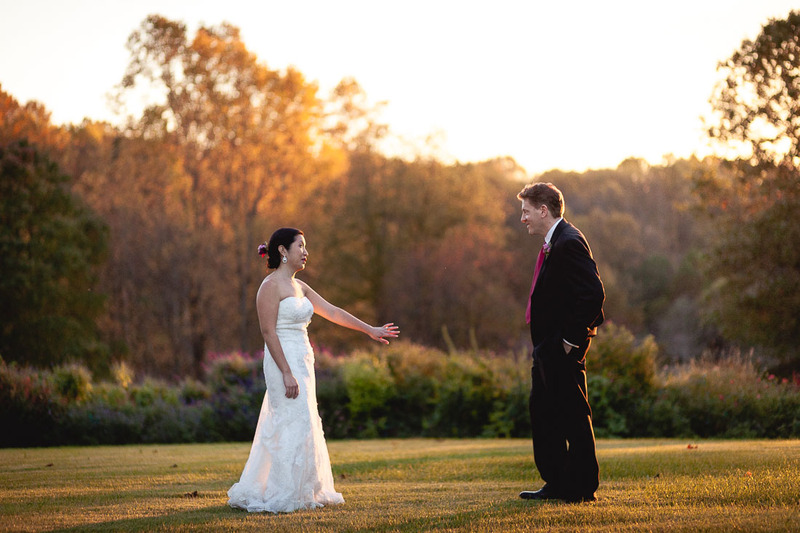 We recommend booking one year to 10 months in advance of your wedding day. Last minute bookings are occasionally available, don’t don’t hesitate to ask. What if we already had an engagement session? Engagement sessions are included as a courtesy in all of our Classic Wedding Coverage packages. While you’re free to opt out of the engagement session, but we cannot adjust the package price for that reason. Learn more about why here. Our packages are all inclusive, but do not include tax. If you wish to schedule wedding coverage outside of our normal service area you will be required to pay for travel. You may also be required to pay for prints, advanced retouching, parking and event or location admissions during the session. No problem, you can jump directly to pricing for our other services using the links below!